After publishing my first Instagram Story, I had a thought. 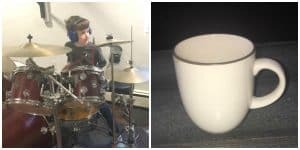 Much of my “story” that day featured photos of food and coffee. (My kids had an unexpected early dismissal, can you blame me?) My story ended before dinnertime and so did my willpower. Somehow, it has become the norm to photograph our food and share it on social media. But what if we chose to photograph each meal, snack, every glass of wine and all the times we carelessly tossed leftover food from our children’s plates into our mouths? Would we want to share these photos? Would we want people to comment? I decided against bombarding everyone’s social media feeds with my photos. Could you imagine the subsequent unfollows and defriending that would occur? And then, I discovered the newest feature of the Lose It app: Snap It. 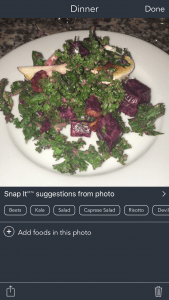 It enables users to create a photo food journal by snapping photos of their meals with their phones, whereby the app breaks down its components and analyzes the calories. I had used Lose It before; despite being a healthy eater, I’ve spent years of my life logging my food intake from [easyazon_link identifier=”1439190275″ locale=”US” nw=”y” tag=”mypurstr-20″ cart=”n” localize=”y” popups=”n”]Atkins[/easyazon_link], the [easyazon_link identifier=”0312991193″ locale=”US” nw=”y” tag=”mypurstr-20″ cart=”n” localize=”y” popups=”n”]South Beach Diet[/easyazon_link], Weight Watchers, My Fitness Pal, and also, Lose It. I admit that I feel a little strange using my iPhone publicly to take photos of my food. When my friend caught me trying to discreetly photograph my very ordinary looking salad, I explained myself. She told me that it sounded a bit similar to mindful eating. Although our children study mindfulness in school, I found this intriguing as I had never heard this term applied before to food. It includes attentively focusing on the food and utilizing your senses to appreciate it. Did I mention that the Snap It feature is in beta mode? I find it all rather amusing. Supposedly, the more you use it, the more its accuracy improves. 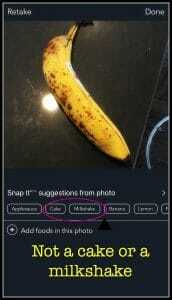 So how does Snap It work? Once you download the free Lose It app, click on “log” for today. Listed next to each meal (breakfast, lunch, dinner and snacks), you will see a camera icon next to a plus sign. Click on the camera and take a photo. Suggestions pop up or instead, you may add foods manually by searching through the database or scanning a barcode. After taking a photo, I usually find myself doing the latter based upon its far-from-perfect suggestions. Sometimes, I purposefully save the photo so I can enter the information at a later time. But, I always take the photo. It’s amazing how easily you can forget about that extra glass of wine. As I mentioned earlier, I have not concerned myself with calories. Yet, at the end of almost every day, I find myself under the budgeted caloric amount allotted to me. Rather taking a photo of that extra handful of chips, I just skip eating them entirely. This mind game is working for me. In one week, I lost two and a half pounds. Have you ever tried a photo food journal? And now, the fun part: Who wants to do try this with me? Comment below and include your email or send me a private message and I will add you as a friend on Lose It. As always, I believe in a community to help and support one another. Don’t forget to log your workouts too.